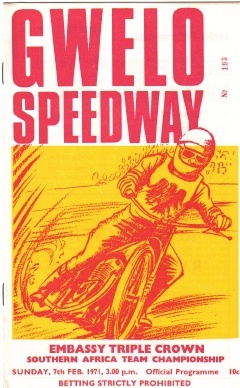 This match, the very first speedway meeting in Southern Rhodesia, was held at the conclusion of the Royal Agricultural Show, and the teams were a mixture of riders from South Africa (S A), Southern Rhodesia (S R), and Northern Rhodesia (N R).The above details have been researched by Ken MacLeod from the Herald (Salisbury) and the Chronicle (Bulawayo). The track was 470 yards long, and the 3-lap track record of 70.1 secs was set in the final heat of the match. The attendance was 12,000 - a record for a sporting event in Bulawayo, and a quarter of the town's population. The track appears to have had four distinct corners. The first meeting in Northern Rhodesia was the Northern Rhodesia Open Championship at the Kitana Stadium, Kitwe, on 16.07.53. It was won by South African Bob Serrurier, who was resident in the country at the time, and who was a prime mover in these early efforts to establish the sport in Rhodesia. Bert Clark, of Northern Rhodesia, became the first Rhodesian to ride in the UK when he rode for the ill-fated Edinburgh team in 1954. Team manager for this series for South Africa was Trevor Blokdyk. For Rhodesia Stars, team managers were Martin Lee (Bulawayo), Gerald Spanton (Gwelo) and Alex Hughson (Salisbury). Not sure what happened in hts 2 & 3! Rhodesia : Peter Prinsloo, Mike Ferreira, Pip Harris, & Ray Barclay. 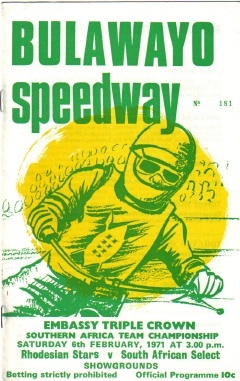 At Salisbury, Peter Prinsloo was only beaten by Dennis Newton in heat 5. 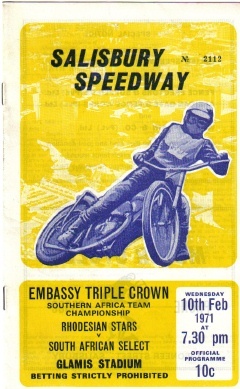 At Bulawayo, other than through engine failure, Prinsloo, Ferreira and Harris rode undefeated.